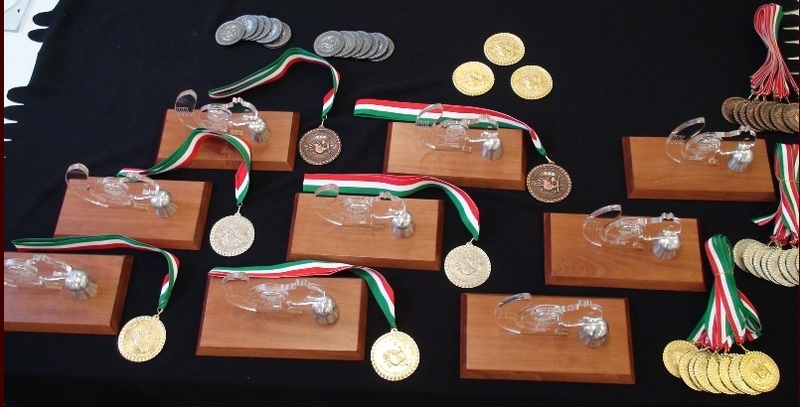 Goal of the competition: To select the individual and the team World Champion of the Field Target sport in 2010. Other goals include popularization of the field target sport, and to strengthen the international sport relationships. Location of the competiton: Debrecen-Bánk, Hungary. The shooting range can be found here: link. Type of the competition: Individual and team competition. I-II-III. ranks: trophy, certificate and medals. IV-X. ranks: medals. These kind of unique medals can be won: Prizes. The individual World Champion of the PCP category will be awarded an exclusive prize of the STEYR company. The individual World Champion of the springer category will be awarded a special prize of the DIANA company. In the individual competition the best junior (born in 1992 or later), the best senior (born in 1950 or earlier) and the best women will also be awarded. I-II-III. ranks: trophy, certificate and medals. Each registered shooter will receive the T-shirt of the event sponsored by the JSB company. Each shooter will receive a Certificate of Participation. Individual registrations were made as pre-registrations. The registration is closed. It is possible to register more individuals only if allowed by the competition organizer. The deadline of the team registration is 18.00 on 30th September, 2010. One team shall consist of at least 4 shooters, the maximum is 8 shooters. One consolidated adult age group. But the best junior, the best senior, and the best woman shooter will be prized. 3 x 25 lanes, two targets per lane. According to the HFTA Rulebook. Between 8.00 - 18.00 on 30th September in the Shooting Range, at the even center. Each rifle must be registered in the logbook of the Shooting Range on arrival to the Shooting Range on the Shooting-in day. The rifles and the equippment is controlled every competition day at the speed control station set up in between the lanes. Each day all shooters must be controlled. If the shooter is not controlled he will be disqualified. Two chrony-s will be set up on the practice area in order to set the correct speed. Shooting range opens at 8.00 (only the practice area) – shooting range closes at 18.00. Registration / logging in: between 8.00 and 18.00 o'clock at the central tent (event centre). Air supply, buffet is available during the whole day. 19.00 pm on 03 October 2010. In the Hotel Divinus - during the Gala Dinner (with live music).